Have you visited The Greeting Card Shop yet? The Greeting Card shop has a fantastic selection of cards for every occasion, age and at great prices too! 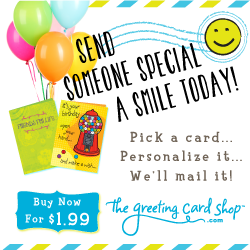 What is super about their service is that you can choose the card you want, personalize it and they will mail it for you! How great is that? They also have a selection of blank cards for you to create to your own specifics, really a great all-round service. With Father's Day coming up it is the ideal time to try their service out, and the wonderful folk at The Greeting Card Shop have offered you, my readers, a great discount until July 31st 2013. If you place an order for cards with them between today and then, you will receive your 3rd card FREE, yes that is right, buy 3 cards and only pay for 2! Use the Promotional Code: 3RDFREE* at the checkout to get your 3rd card for FREE. Follow the link below to start making wonderful cards for your loved ones and friends today! *Promotional offer expires on July 131st 2013. Discounts a maximum of $1.99 per order with a minimum purchase of 3 greeting cards in the shopping cart.